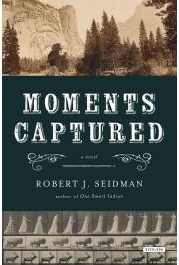 “Moments Captured is the captivating story of two indelible individuals and a shattering murder in late nineteenth-century San Francisco. An epic saga of young America flexing its muscle, it is roughly based on the life of the great photographer Edward Muybridge. Crossing the country with his camera and outsized ambition, Muybridge meets the emancipated young dancer Holly Hughes, and inexorably she becomes the true focus of his life- though a corrupt robber baron interested in Muybridge’s talent for technology comes between them. And Wild West women, too…. That’s enough of that. I wonder how many of these imaginary incidents in Muybridge’s life will seep through into factual accounts and our general perception of the man and his work. The book has gained some good, genuine reviews, and I look forward to reading it. Then every time one of these magic discs that your readers have cut out and pasted onto cardboard is handed to a friend to enjoy, they’ll read the advert and rush out and buy the paper, or better still subscribe. Brilliant, and all for free, courtesy Scientific American. And the best bit is, 130 years later, it’s still for free, courtesy of that excellent resource, the National Library of Australia’s TROVE. More about these paper discs, here.